Black spiders and spiderweb Halloween decorations are a ubiquitous symbol associated with the holiday. There are many choices of commercially produced decorations available in all shapes and sizes and media. If you are looking for ideas that lend themselves to a familial gathering, then you should consider the do-it-yourself Halloween craft projects presented in this article. 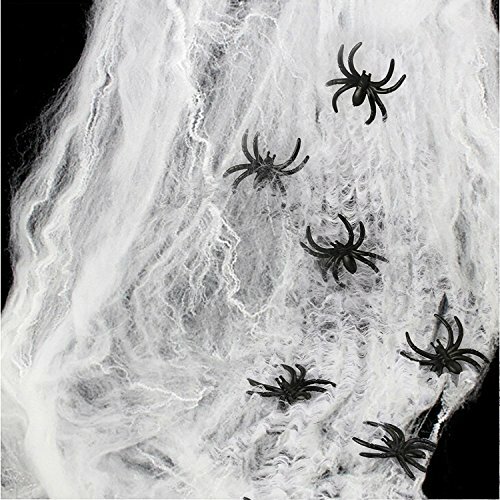 All of these spider Halloween decoration ideas draw from the four books listed in the sources section at the end of the article. One quick and easy take-notice spider Halloween decoration is to use netting and inflatable spiders. An artist from Santa Barbara, California uses this technique to create a haunted house in the garage using "netting he buys at the local nursery. He places an inflatable spider on the netting so it looks like it's just hanging on." (Brokaw & Gilbar, 34) Alternatively, you can replace inflatable spiders with large paper spiders. Spider webs are typically associated with spider Halloween decorations. The most popular form of spider web used for decoration is white cotton or similar material strung out in different directions. 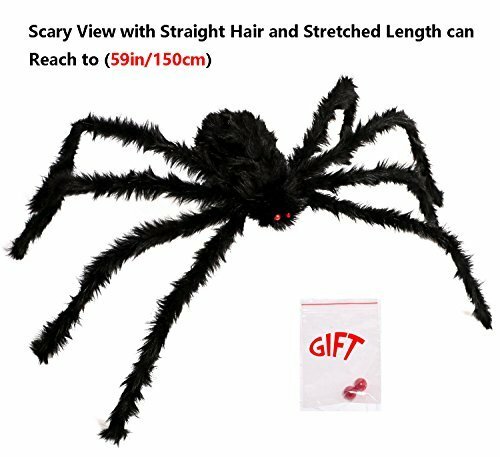 Spider webbing material is available in most drug stores and discount department stores in the weeks leading up to Halloween. One alternative, as we have seen, is netting. Another idea is to use black crepe paper. Instructions for creating black crepe paper spider webs can be found on page 38 of The Penny Whistle Halloween Book. Two spider Halloween decoration ideas related to food service are etched glasses and coasters. These two projects are presented in Hocus Pocus! Halloween Crafts For A Spooktacular Holiday with materials lists, detailed instructions and patterns for creating the designs. The glass etching patterns include a spider dangling from a web, while the coaster patterns include a spider sitting in the middle of a web. To add more dramatic effect to the etched glasses, you can give the images a 3-D effect. To do this, you simply rinse away the first coat of etching cream that creates the overall image. Then you apply etching cream to the outer edges of the pattern. With progressive cycles of applying etching cream and rinsing, the etched areas get progressively deeper. The coaster spider Halloween decoration project calls for black and mulberry paper, which is used to create the image and orange tissue, used for the background color. As an alternative, you could use the pattern to create etched spider Halloween coasters to create matching sets of etched glasses and coasters with a spider and spiderweb theme. If you really want to get creative, consider making the glasses and coasters compliment each other. Etch a positive image onto the glasses while etching a negative image onto the coasters or vice versa. This project is presented with a materials list, detailed instructions and a spiderweb pattern. It involves stringing beaded strands within a picture frame to create the spiderweb. The project photo shows a beautiful example using a gold wooden frame. Use these spider Halloween decoration ideas to get you started. All of the ideas presented can be combined for a spider theme Halloween party or simply to set the atmosphere in your home for some holiday spirit. Remember, you don't have to go overboard in your decorating. 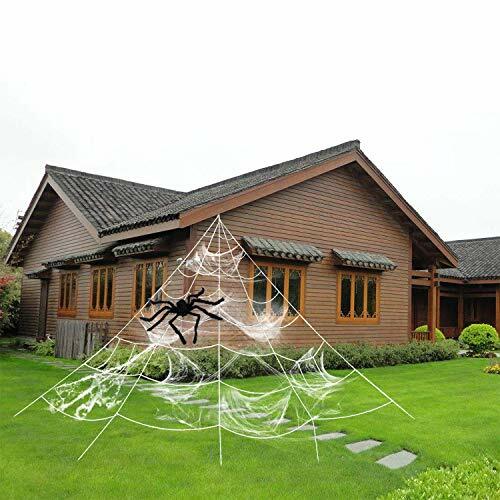 A few well placed spider Halloween decorations will give the desired effect without becoming overwhelming or gawdy. ---.50 Boo-Tiful Full-Size Halloween Patterns And 100 Tricks For Using Them. Better Homes & Gardens, 2002. Brokaw, Meredith and Annie Gilbar. The Penny Whistle Halloween Book. Fireside, 1989. ---.Hocus Pocus! Halloween Crafts For A Spooktacular Holiday. Martingale & Company, 2003. Lyons, Charlotte. Mary Engelbreit's Autumn Craft Book. Andrews and McMeel, 1996.